Background: Calcium consumption during pregnancy reduces the incidence of pre-eclampsia/eclampsia among women with low calcium intake. Nepal implemented a pilot program to ascertain the feasibility of distributing calcium during antenatal care (ANC) services and follow-up by community health volunteers (FCHVs). We conducted a study to assess the effectiveness of the program. Methodology: A post-intervention cluster household survey of women who had given birth in the last six months (recent mothers) was conducted. Secondary data from supervision visits to antenatal health care workers and FCHVs were analyzed. Results: 1,240 recent mothers were interviewed and 109 ANC health worker and 112 FCHV questionnaires were analyzed. Most recent mothers (95%) attended at least one ANC visit with a median gestational age of four months at visit one. 94.6% of recent mothers (100% of those attending ANC) were counseled on calcium and received it. 67% of women who received calcium reported taking the full course (150 days), and nearly all (99.2%) said they took it as instructed with respect to dosage, frequency and timing. Significant predictors of completing a full course are gestational age at first ANC visit and number of ANC visits (p<.01). Among recent mothers who took both calcium and iron during pregnancy, 98% reported taking them at different times of the day. Cost and bulky size of tablets remain challenges. Conclusions: Calcium distribution through ANC was feasible and effective, achieving 94.6% coverage of pregnant women in the district. Most (over 80%) of women attended ANC early enough in pregnancy to receive the full course and benefit from the intervention. Distribution of calcium through ANC services achieved high coverage and compliance among pregnant women and was feasible to incorporate into ANC health workers’ current responsibilities, this intervention is recommended for scale-up in Nepal. As the in-country lead for promoting the 2014 State of the World’s Midwifery and the Midwifery 2030 goals, UNFPA’s office in Mexico has been coordinating closely with the Ministry of Health and other partners to develop a work plan for national and state-level work that will strengthen midwifery. As the Mexico midwifery initiative develops, UNFPA-Mexico will coordinate state-level work by partners including public and civil society players. The work plan is based on the design of the SOWMY, and identifies specific actions needed in order to advance on each of the four components of accessibility, availability, acceptability and quality. For example, for state-level health planners to be able to ensure availability of midwifery services, they require certain inputs that must be designed at the national level, such as methodologies for planning deployment, estimating cost-effectiveness, or determining how to best promote integration into health teams that have grown unaccustomed to natural childbirth and to working as teams with mid-level providers such as midwives. UNFPA’s Mexico office’s contribution to this panel will be to share its methodology for using the SOWMY for putting together a comprehensive plan for strengthening midwifery in countries like Mexico, which require building the profession – including basic elements such as creating and certifying new training programs, encouraging health authorities to consider midwifery as an option, analyzing and improving laws and policies, countering stigma in the health system as well as among women and communities that have become distanced from non-medicalized birthing options. 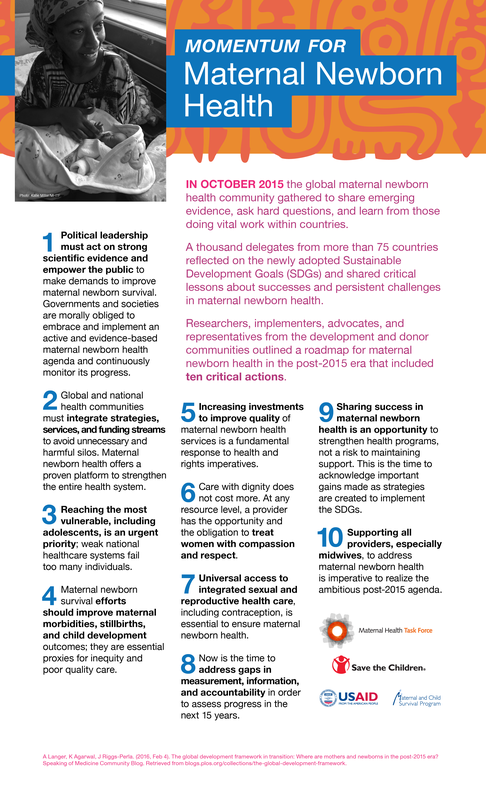 The 2014 State of Midwifery in the World includes Mexico for the first time, detailing the number of available human resources and estimating time allocated to maternal and newborn health care. It estimates that Mexico today has 78 professional midwives (vocational level), 23,000 auxiliary (traditional) midwives, and 16,200 nurse midwives (obstetric nurses). The small group of professional midwives (not all of whom work in the public system) dedicate full time to providing reproductive health services, while traditional midwives provide an ever-decreasing number of services (approximately 1 – 2% of all births), and the vast majority of the nurse midwives play only a minor – if any – role in providing these services, as most are employed in administrative or support positions. As a result, Mexico’s estimated met need for maternal and newborn health care is only 61 percent. In conjunction with UNFPA-Mexico, the Mexico Safe Motherhood Committee (a network of civil society organizations, Mexican health sector, and international agencies), designed a Mexico-specific report that builds from SOWMY and provides greater detail for use in Mexico: what indicators are most useful to the advocacy community, what national policies and regulations uphold or fail to uphold midwifery, and recommendations for the country based on local conditions and demographic projections. For each of the SOWMY report’s recommendations for availability, accessibility, acceptability and quality, the Mexico-specific document provides specific recommendations, including the need to create jobs for midwives and adequate coordination with health personnel. Planning and increased deployment are also urgent, given that only 8 of Mexico’s 32 states have employed professional midwives in recent years. The Committee will share how it has adapted SOWMY to the national context and developed plans for using it as an advocacy tool with state-level health authorities, congressional committees and other health planners and operators. The current federal administration began in December of 2012 and will end in the fall of 2018. The Ministry of Health’s National Center for Gender Equity and Reproductive Health has developed an initiative for the next three years that seeks to rebuild professional midwifery in the country and make significant contributions toward this end before the administration’s end. The Center will encourage Obstetric and Perinatal Nurses to provide midwifery services within the public health system. It will collaborate with the National University system’s School of Obstetric Nursing to build a new program to engage newly graduated students in rural areas of the country to do their one-year compulsory social services. It intends to identify and engage a group of some 90 recent graduates in a new program that will insert them into the health system at the primary and secondary levels through one-year social service internships. These students, along with other more seasoned nurse midwives who will be hired to serve as midwives, will eventually serve as a liaison between communities, traditional and technical midwives, and health providers in clinics and hospitals, namely doctors, gynecologists-obstetricians and nurses. The program seeks to break down barriers among these key health providers by deploying a new cadre of nurse midwives and building trust and teamwork in a hierarchical system riddled with misunderstandings and even skepticism about the quality of care that can be provided by midwives. The program builds from experiences learned recently in a UNFPA-ICM (International Confederation of Midwives) convening in Costa Rica, where participants learned about midwifery forces in the Latin American region. The Center’s participation in this panel will be to share with the public this new program and how it intends to roll out, what impact it seeks, and the challenges it may face as it develops. MacArthur Foundation has operated a reproductive health program in Mexico since the early 1990s. Since 2000, MacArthur’s grant-making strategy has focused on two areas: maternal health, and reproductive and sexual health of young people. In 2014, the Foundation determined a final phase of grant-making in reproductive health for Mexico that will focus exclusively on one issue that emerged from support to civil society organizations under its maternal health programming: professional midwifery. This final phase will last from three to five years. MacArthur’s participation in this panel will present the Foundation’s new program, the logic behind it, its objectives and the processes both within the Foundation and within the field in Mexico to build this new phase. MacArthur’s contribution to the panel includes sharing our thinking about exiting fields in which we have been an important actor for years, and our thinking of how to best yield results and impact within a short period of time. This includes broadening the Foundation’s intervention as a grant-making institution to include new activities such as deeper and more frequent engagement with partners from government, civil society and international cooperation agencies; providing resources for a multifaceted communications strategy to raise awareness about professional midwifery; convening meetings and facilitating cross-sectoral coordination and collaboration; and contracting a comprehensive evaluation of the initiative with three specific evaluation points (baseline, midline and end-line). Can High Quality Maternity Homes Facilitate Access to Facility Delivery in Zambia? Background: Residential accommodation for expectant mothers adjacent to health facilities, also known as maternity homes, is a strategy to improve access to skilled deliveries in low-income countries like Zambia where the maternal mortality ratio is 280-398 deaths per 100,000 live births. Our study aimed to describe the general conditions of maternity homes and to assess the relationship between maternity home quality and likelihood of facility delivery in Kalomo District in Southern Province, Zambia. Methods: We systematically assessed and inventoried the functional capacity of all existing maternity homes in the domains of 1) infrastructure and amenities; 2) funding and maintenance; 3) management and operations; 4) utilization and services; and 5) communication and care coordination, using a quantitative facility survey and photographs of the structures. We calculated a composite score to rank maternity home quality and used multivariate regression to assess the likelihood of facility delivery based on this score using household survey data collected on delivery location in Kalomo District from 2011-2013. Results: In Kalomo, 69% (25/36) of facilities had an affiliated maternity home. Despite operating on average for 9 years, they were generally in poor condition and varied widely across the 5 domains examined. Of 8,033 total deliveries recorded from 2011-2013 in catchment areas for 18 Kalomo facilities, a higher proportion occurred in facilities where maternity homes were ranked high compared to low (64.1% versus 55.2%, p<0.001). After controlling for confounders including implementation of Saving Mothers Giving Life, a large-scale maternal health systems strengthening program, women were still 54% more likely to deliver at facilities with a high quality maternity home (OR: 1.54, 95% CI 1.38,1.71). Conclusions: Improving the quality of maternity homes represents a potentially useful strategy to increasing facility delivery in rural Zambia. * With funding provided by Merck Sharp & Dohme Corp. This entry was posted on October 16, 2015 by Jacque Caglia. Background: Home delivery is a cultural norm in Samburu County which is exacerbated by long distance to health facilities, poverty and illiteracy. Skilled birth attendance is important in reducing maternal mortality yet the proportion is low at 19% as compared to 62% nationally. International Medical Corps (IMC) has been supporting the county health department to improve maternal and child health through capacity building of health workers since 2011. Mother to mother support groups were also initiated at community level to promote good infant and young child feeding practices. The groups identified the lack of a maternity as a major problem affecting women in Nachola Village, with the closest being twenty kilometers away. Methodology: In 2013, nine group members took the initiative to construct a maternal shelter to house maternal health services. This would be located adjacent to the MOH supported dispensary. With support from IMC, group members were mobilized to contribute locally available construction materials. Pregnant women were also sensitized about the shelter through mother support groups meetings at community level, by community health workers and referrals by other mothers. The services provided include antenatal care, birth plan preparation, delivery and postnatal care provided by a nurse/midwife recruited by the county health department. Complicated cases are referred to the next level for management. Results: Skilled delivery at Nachola dispensary was 27% in 2014, 13% in 2013 and 0.6% in 2011.This shows an increasing trend as compared to the overall 19% for the county. It has also provided an opportunity for education on nutrition, immunization, breastfeeding, family planning etc. provided by the nurse/midwife. Some communities in the neighbouring Turkana County have since learnt about the maternal shelter and replicated it. Conclusion: The maternal shelter is a useful intervention to increase skilled deliveries in remote areas and could be easily replicated. Background: Delays in reaching skilled care cause maternal deaths. Over years, Government of Zambia invested in maternity waiting homes (MH). With Merck for Mothers funding, Jhpiego’s formative research in 2014 examined MH use patterns, user/community needs and entrepreneurial models to sustain MHs in Luapula province. Methods: This study included 21 qualitative focus groups (FGDs) with 180 women and men, 96 key informant interviews and structured surveys, and observational assessments at 17 MHs and 21 health facilities. Participants included pregnant and recently delivered women, antenatal couples, senior women, community volunteers, traditional leaders, partner organization representatives, facility in-charges, district health leaders, and agricultural officers. Multiple analysts coded transcripts for a priori and emergent themes. Results: Pregnant women are encouraged by leaders and families to deliver in facilities – thanks to high knowledge of obstetric complications and fines for home-delivery. However, many MHs were incompletely constructed and completed MHs were sometimes used as office, storage or exam rooms. Conditions at health facilities and MHs were insufficient due to lack of infrastructure and maintenance, inadequate management, and overcrowding. Barriers to use included concerns about privacy, security, lack of mattresses, food and blankets, and limited cooking space and toilets. In short, the MHs were not ‘homes’ that preserve dignity. Suggested solutions included community-run gardens, aquaponics and/or fish farming to provide nutritious food and generate income to improve and maintain the MHs. Community involvement for labor and transparent management of income-generation funds along with continued facility funds was seen as essential, especially at the start-up phase. Conclusions: Despite enthusiasm among community leaders and members to promote facility delivery, barriers to use of existing MHs abound. A broader health system plan for integrating MHs into health facilities and communities is needed to ensure rural women safe childbirth. Background: Promundo-US and the Rwanda Men’s Resource Center are conducting a randomized controlled trial of a gender-transformative program that engages new and expectant fathers in group education to promote their greater involvement in maternal and newborn health. Research shows that supportive male partners are associated with improved maternal health service utilization and better maternal health outcomes. Our presentation will highlight practical experiences of implementing fathers groups with more than 2,000 men in Rwanda and baseline data from 1,195 men. The fathers groups form part of the MenCare+ program, a four-country initiative to engage men in sexual and reproductive health and rights and maternal and newborn health. Methodology: This program utilizes gender-transformative group education on maternal, newborn and child health, adapted from Promundo’s Program P to promote men’s equitable and non-violent participation their children’s and their partners’ lives. Eligible men were randomized into control or treatment groups. The treatment group participated in 15 weekly group sessions to talk about their roles as fathers, to learn about maternal and newborn health, and to reflect on men’s role in pregnancy, antenatal care, child birth and beyond. Small group discussion and activities led by a facilitator created a safe space for men to discuss, learn and rehearse more equitable and non-violent attitudes and behaviors. Results and conclusions: Engaging men in challenging inequitable gender attitudes and behaviors that hinder their participation in maternal and newborn health can successfully promote equitable and involved fatherhood. Our presentation will describe the program and the RCT, and will provide initial baseline findings around men’s attitudes about and participation in antenatal care, delivery, and caregiving. The presentation will highlight lessons learned from the program and the evaluation and contribute to the evidence on effective programming to promote men’s equitable involvement in maternal and newborn health. 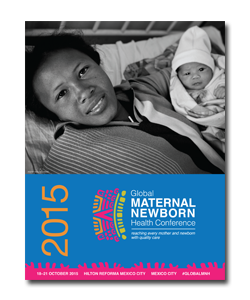 Background: Gender norms and inequalities shape maternal and child health. Early marriage and childbirth contribute to maternal mortality and poor birth outcomes, and women’s limited control over family resources may impede uptake of ANC services. Norms that leave household chores and health issues as women’s responsibility reduce time available for breastfeeding and may reduce men’s support for use of health services. Methodology: We reviewed the evidenced base for gender-integrated social behavior change communication (SBCC) interventions that promote behaviors relevant to maternal and child health and describe interventions that build on the evidence base. Interventions were identified from systematic searches of the published and grey literatures. Studies were eligible if an SBCC intervention addressed gender (e.g., search terms included gender dynamics, spouse, interpersonal relations), measured relevant behavioral outcomes (e.g., antenatal care, nutrition), used at least a moderate evaluation design, and were implemented in low- or middle-income countries. Results: Most (N=22) of the 23 interventions identified addressed reproductive and maternal-child health behaviors (e.g., birth spacing, antenatal care, breastfeeding). Eight interventions acknowledged, but did not seek to change gender norms and inequalities, and 15 sought to change gender norms or inequalities. Evidence suggested that engaging men in health education and counseling was beneficial. Evidence was most compelling for SBCC approaches that empowered women. For example, participatory approaches that gathered women together and empowered them to address health issues in their community were shown to reduce maternal and child mortality. Conclusions: Our review suggests that addressing gender in maternal health interventions is beneficial. Building on this evidence base, the MCSP program is carrying out formative work in Tanzania, Rwanda and Nigeria to better address gender in clinical services and SBCC programming. SBCC activities, for example, will constructively challenge norms around GBV and constructively engage men in health promotion around antenatal care.